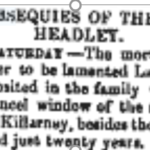 The Headley family whose lands were mainly in two locations – Glenbeigh and Castleisland/Knocknagoshel, enjoy (if that is the appropriate word) a mixed reputation in the history of Kerry Landlords.. From the ‘venerable and ever to be lamented ’ Lady Anne Headley to the notorious Glenbeigh evictions carried out by a later Headley and his agent, your view depends on which location and what period your Kerry ancestors were their tenants. It was George Allanson-Winn, created a baronet in 1776, who acquired a substantial Irish property through his second marriage in 1783 to Jane Blennerhasset, daughter and co-heiress of of Arthur Blennerhassett of Ballyseedy. The Winns were originally a Yorkshire family. 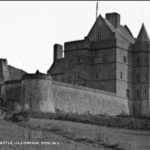 Their estate amounted to over 25,000 acres in county Kerry in the 1870s. George was made an Irish peer as Lord Headley, Baron Allanson and Winn, of Aghadoe in the County of Kerry in 1797. George died in April 1798 and was succeeded in his titles by his eldest son Charles then aged 13. Both father and son were members of the British parliament representing Rippon During his time at Westminister. Charles initially was an absentee Landlord, living and travelling between his English and Irish estates. In 1826 he married Anne Matthews and 1828 he built a house in the outskirts of Killarney – Aghadoe House. He appears to have lived more permanently here from that time on. 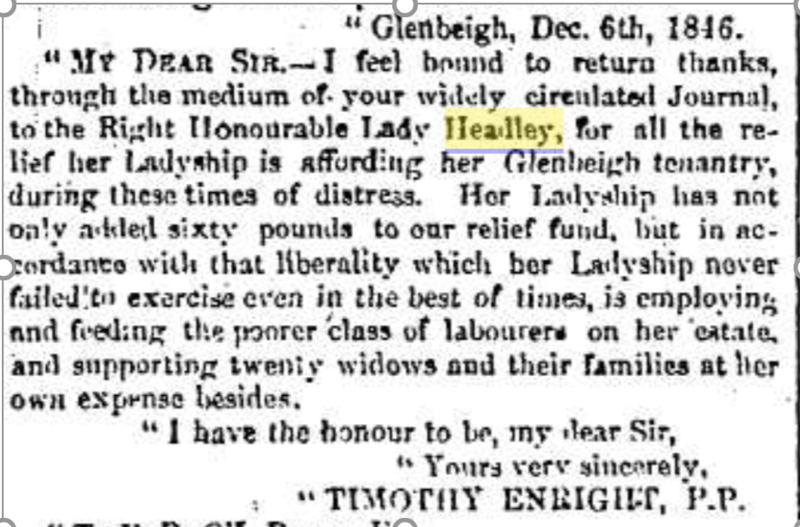 In 1835 the Kerry Evening Post informs us that Lord & Lady Headley had returned to Killarney after a ‘fifteen month sojourn on the continent’ and we know that he gave a substantial donation to a Relief Fund for the Poor of Killarney in 1837. He died in 1840 engendering a dramatic black lined announcement in the Kerry Evening Post. The 2nd Lord Headley’s burial was in the family vault of Aghadoe Parish Church where his wife, Lady Anne joined him twenty years later. In the years between 1840 and 1863 when she died, Lady Headley was the subject of only much praise for her generosity and kindness. ‘The good and gracious Lady Headley has come forward this year with her usual generosity, to assist the poor in the neighbourhood of Killarney. It would be a fortunate circumstance for this country if our apathetic gentry would follow the example of this bountiful lady’. After a sojourn of some months at her marine residence at Rosseigh, Lady Headley returned to Aghadoe House on Saturday. The ‘tenantry at Aghadoe, anxious to give expression to their joy and to testify their veneration and gratitude determined to give her ladyship a right royal reception’. Anxious crowds awaited her carriage from an early hour, bonfires and triumphal arches, merry danced around it to a late hour to the strains of bagpipes and violins, ‘six tierces of porter having been provided. Everything passed off with the greatest harmony’. Coming up to Christmas 1846, a year into the Great Famine, a letter in the Kerry Examiner from the Parish Priest of Glenbeigh extols Lady Anne’s virtues. All of these reports, whether in the Kerry Evening Post, the Kerry Examiner or Cork newspapers were at one in praising her. The Kerry Evening Post was politically conservative and its readership would have been mainly Protestant ascendancy. 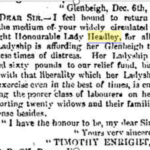 In 1856 the Cork Examiner is again praising the management of the Headley Estate and attributes the improvements to individual properties and the general area of Glenbeigh from what was before ‘barren and unproductive’ to the fact that Lady Headley lived ‘at home among her people’ … ‘the tenants are comfortable and contented’. ‘In 1841, the year that followed her husband’s death, Lady Headley’s order for clothing for the poor was described as ‘munificent’. 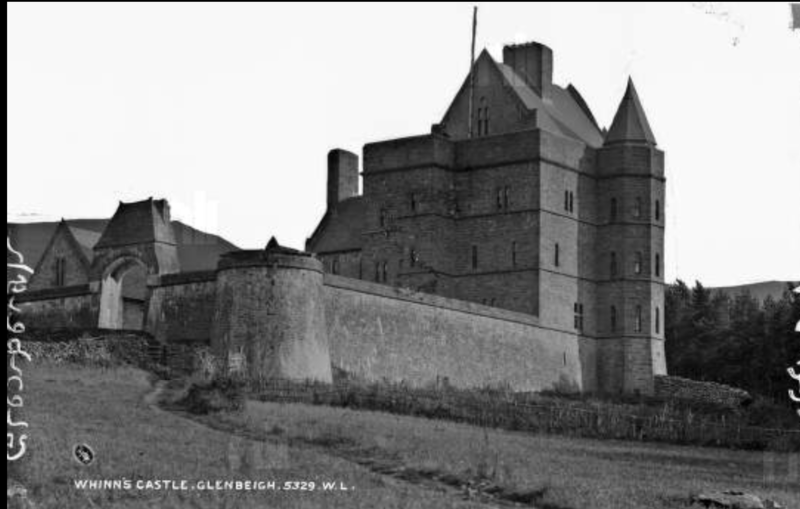 Some years before this, in 1835, she had been welcomed by several hundred tenants and 60 mounted horsemen for improvements on the Castleisland Estate’. In the 1850s Lady Headley started a movement for land revaluation and rent reduction, a move followed by several landed proprietors. In recognition of this, a grand dinner was held in her honour at the Castleisland assembly-room where people ‘of all classes and creeds’ united to bear testimony to one who was ‘as virtuous in private circles as she appears in the public eye’. As an evening of all night dancing commenced to the ‘lilt of O’Leary’s bagpipe’, her agent, Andrew Talbot, said no words of his could convey an adequate idea of Lady Headley’s generosity’. 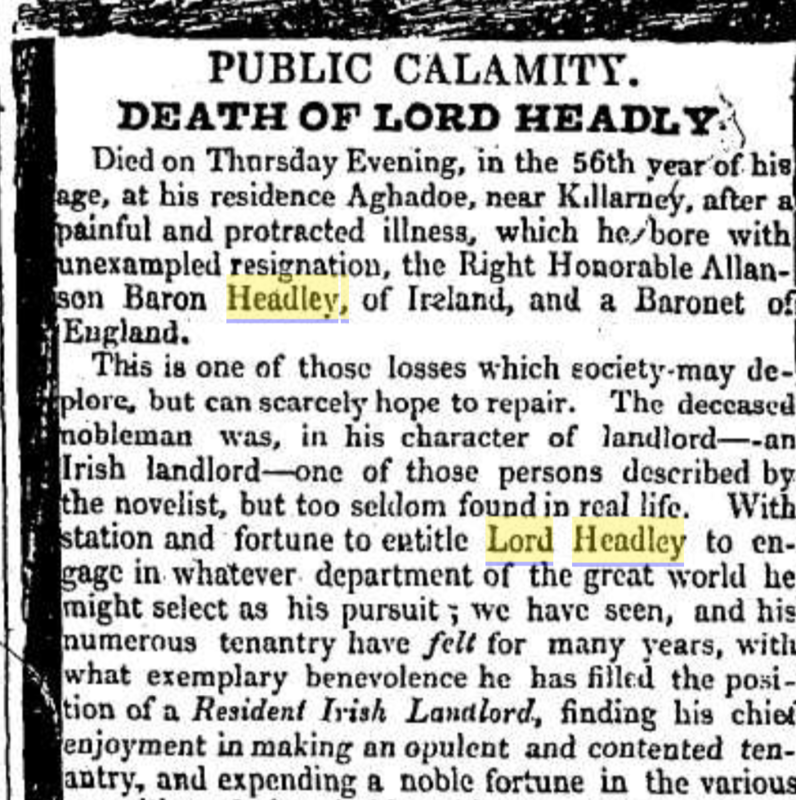 However in 1863, Lady Headley died and the management of the estate went downhill after that. Lady Headley’s husband’s nephew inherited the title and the land. The new owner, Roland Winn was non-resident and had an entirely different approach to the management of the estate leaving decisions to new agents in Glenbeigh and Castleisland/Knocknagoshel. Unfortunately both these agents – Roe in Glenbeigh and Sam Hussey in Knocknagoshel, while undoubtedly carrying out the work of their boss, choose to do his bidding in the harshest possible way. Rents were raised, in some cases by 50%. Lord Headley started to build a castle in 1867 on the outskirts of Glenbeigh to be called Wynn’s Castle but became known as Winn’s Folly. It was believed at the time that the rents were raised to help pay for this extravagance. From 1879 onwards tensions ran high in the Castleisland area. The much-feared Sam Hussey was now Agent and warning the tenantry with the law and eviction if they failed to pay their rent. The Irish National Land League was formed and directed and represented the tenants in their negotiations with their landlords. The agitation prompted the government to introduce a series of Land Acts between 1870 and 1909 which culminated in tenants buying out their land through tenant purchase schemes. Money was running out and in June 1886 Lord Headley was adjudged bankrupt. Pierce Mahony, the Kerry born liberal M.P, for North Meath, who took up the cause of the tenants, wrote a spirited and widely publicised article The Irish Question, The Truth about Glenbeigh. He states that one point was admitted on all sides (1) That the tenants got into arrears owing to disputes between the mortgagee and owner; (2) That it is perfectly useless to attempt to recover those arrears. So in effect, the tenants were pawns in a struggle not of their making. 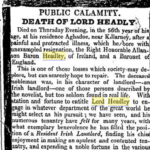 From this time until the tenants finally bought out their tenancies, the Headley name was one associated with the worst excesses of landlordism. There was constant aggravation on both sides with tenants taken to court, accused of burning mountains, knocking trees and general lawlessness. Difficulties were put in the way of tenants buying out. Sam Hussey in particular, was insisting on the highest price possible. Cases were brought to court appealing undue rent increases. A question was asked in the Parliament at Westminister in 1901. The Chief Secretary was asked if he could state what were the difficulties in the way of a sale of Lord Headley’s estate in the County of Kerry, which is now under the Court; and having regard to the fact that the tenants have expressed their willingness to purchase, whether he could do anything to expedite the sale of their holdings to them’. After much negotiation over 13,000 acres of the Winn estate was acquired by the Congested Districts Board in 1907. Finally on 6 February 2007, the Kerry Sentinel reported that ‘the tenants on the Headley estate at Knocknagoshel met the agent Mr. Denny and Mr. J. Murphy Solr., Tralee, a few days ago and signed a purchase agreement at 7s.6d in the £. The game rights, turbary and limestone are reserved by the tenants. The Castleisland tenantry have purchased at 20 years. Kerry Evening Post, 21 August 1901.
if you wished to give a different perspective. If you wish I’ll try and find it again. Lady Headley ,was the landlady of the families of Quirks at Coomasaharn. Glad to know she was a good women.These people were my ancestors. Visited there twice . Very emotional experience to see what my Grandfather seen as a boy& walk the land he walked. God Bless. Tommy Quirk.